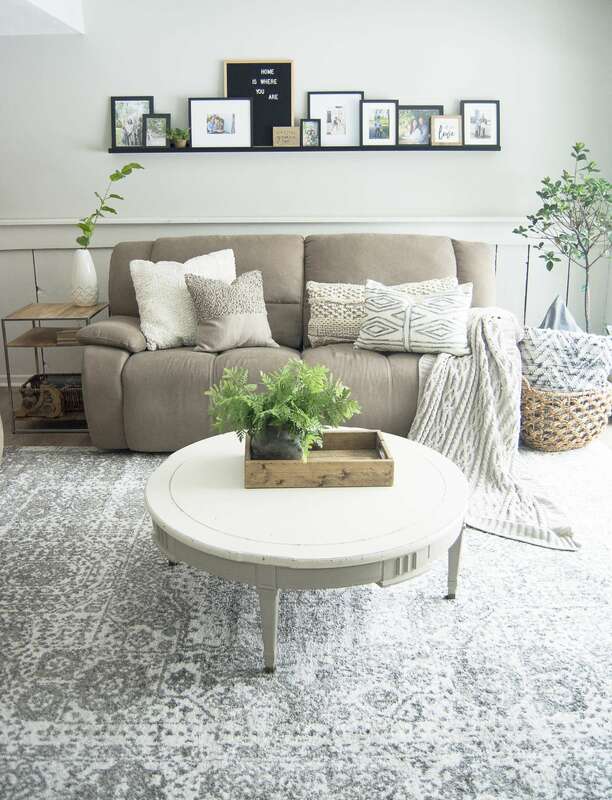 Do you struggle to keep your family room pretty and practical? 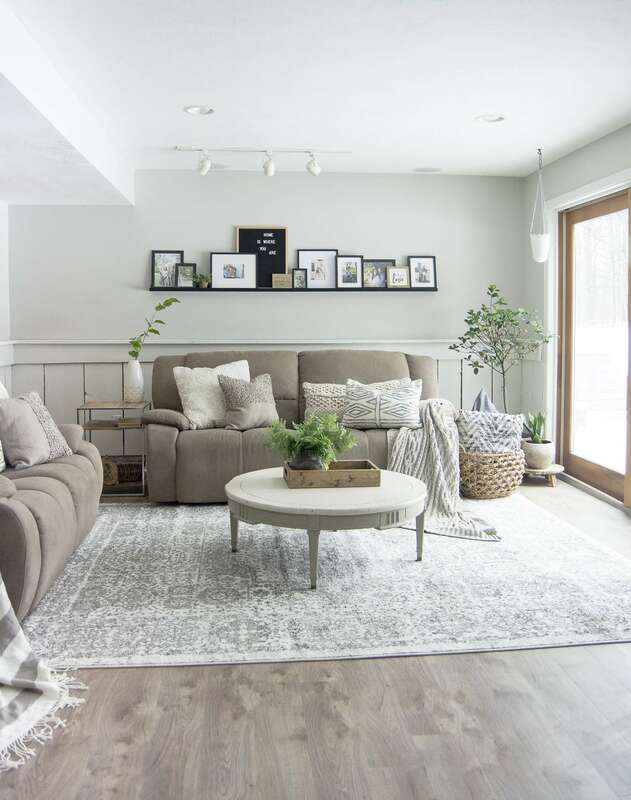 Today I’m sharing my family room design and how I make it work for an active family of four. 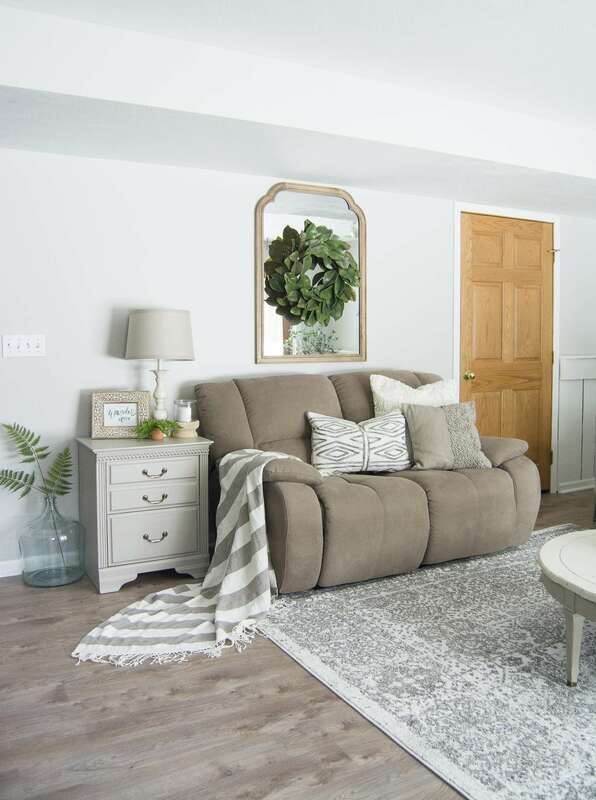 If you’re new to my blog, then make sure to check out all of the posts related to my basement remodel! 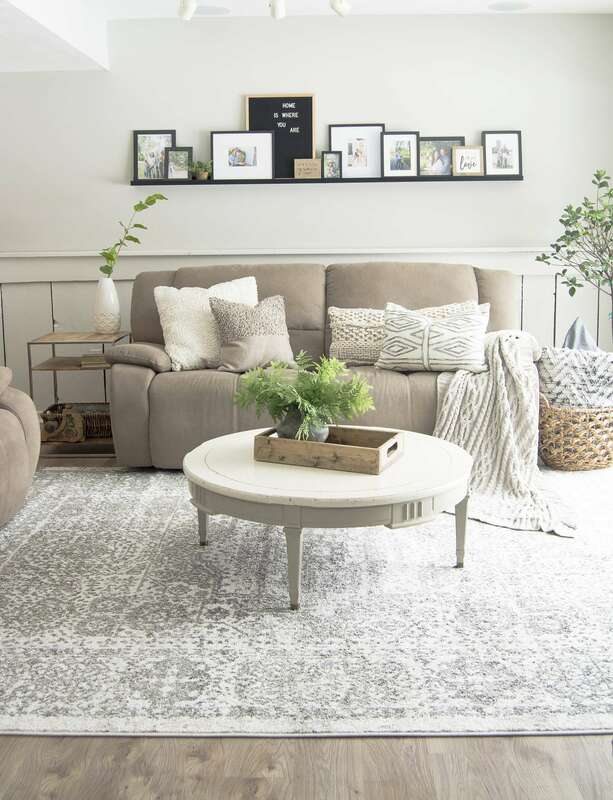 We’ve undergone such a huge transformation so if you’re looking for inspiration for your own family room design, then look no further. I’ve got you covered. After updating our flooring and remodeling the bones of our basement, it was time to think about decor. My favorite part. 🙂 I had three goals for this space. My family room design revolved mostly around my kids. My entire upstairs is very design oriented and I wanted them to have a space where they could rough house and toss balls without me having a heart attack. 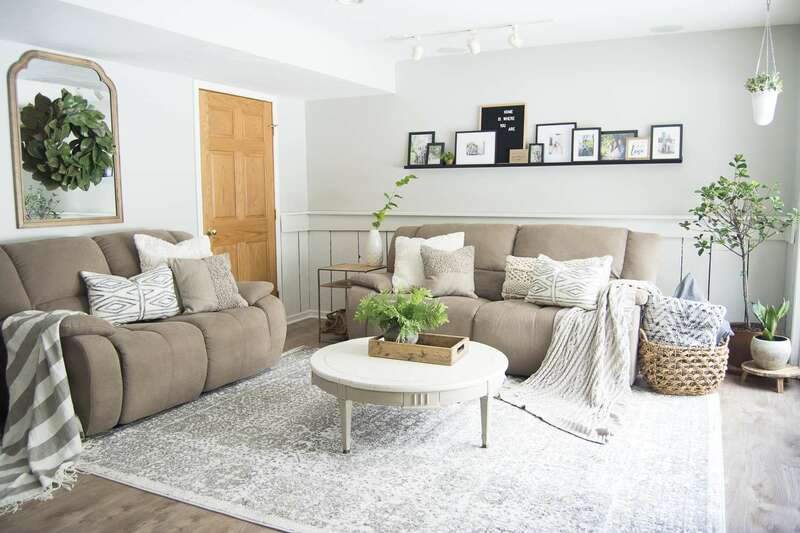 So I designed the basement family room to have wide open spaces, lots of cushy furniture, and minimal decor. We situated our large furniture towards the back of an awkward shaped rectangle room to give plenty of space for the kids to roam. Initially, I wanted our couches to be closer to the TV for a cozy feel, but my husband wanted to try it more spread out and I’ve gotta say, he nailed it. I added minimal accents (for me) with a few framed family prints and a beautiful french country oversized mirror. 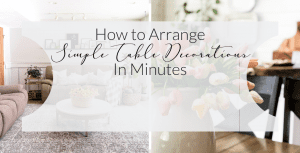 Other than that, our decor includes lots of non-breakables that add to the comfort of the space. I also make sure to include side tables that double as storage. This thrifted side table (originally a nightstand) houses our extra blankets. 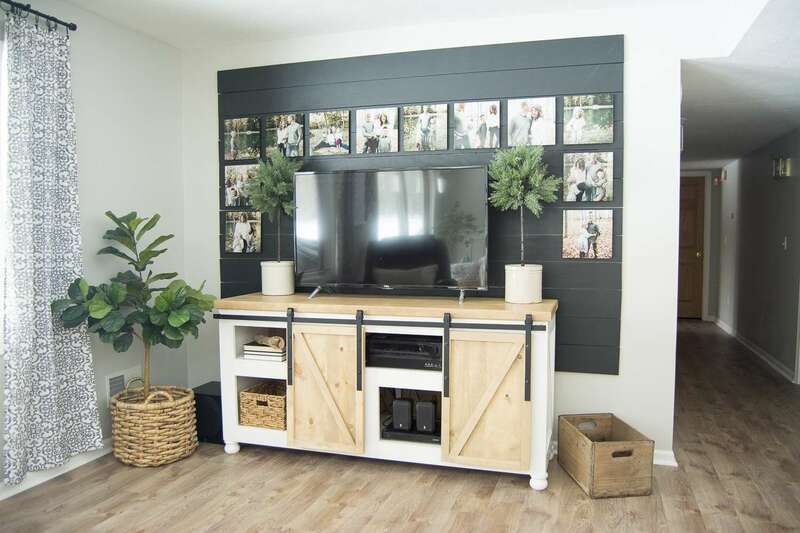 My second goal for this space was to finally make a way to include all of my husband’s surround sound equipment, as well as the TV, without the family room feeling like Radio Shack. Can I get an amen ladies? Not that I have anything against a lovely media experience….but when it takes over my family room, I’m not a fan. 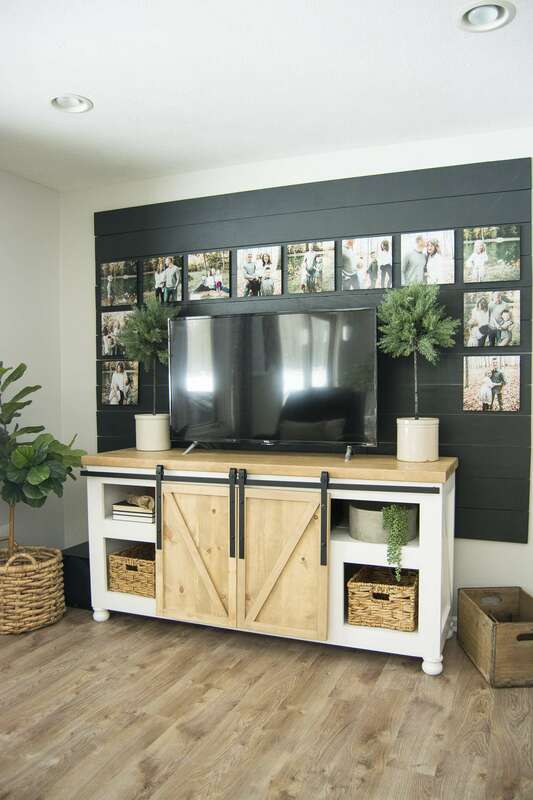 The first step to accomplish this goal was to design this black shiplap wall. I’ll have the full tutorial up on how we created this soon! The purpose of this accent was to add a really interesting focal point while masking the TV. When the TV is off, it blends right into the black background! Victory! I surrounded it with family pictures to personalize the space and I love how it turned out. The next step was to hide the 9 different black boxes involved in the surround sound system. 9 ladies. Nine. I’ve searched for a decade to find a piece of furniture that will provide the functionality needed for this system without it looking like I just came from a heist at Best Buy. No luck. UNTIL….my sweet friend Kristy from the cutest little shop near me, Haven Creek, brought me a solution! 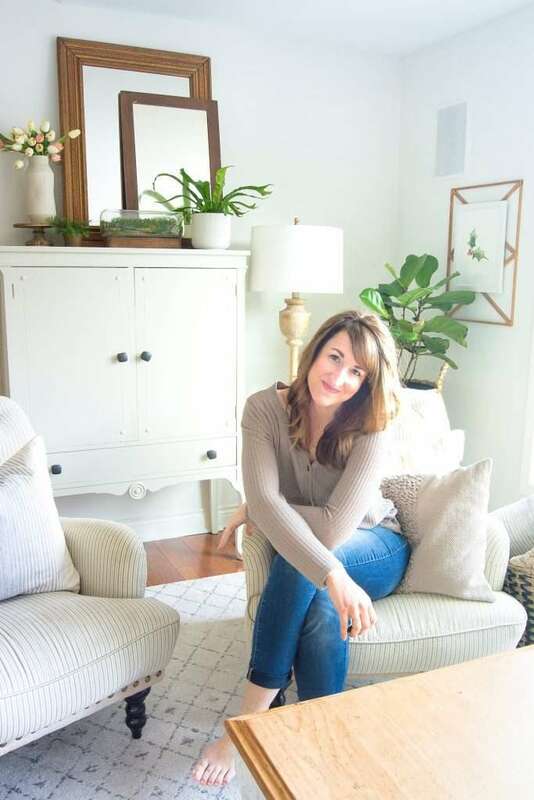 She and her husband, Bill, create beautiful custom furniture pieces. We worked together to create this beautiful media cabinet with all of the appropriately sized openings to hide our system! All we have to do is roll the sliding barn doors open when we want to use it and shut them when we have company over. 10 years friends. 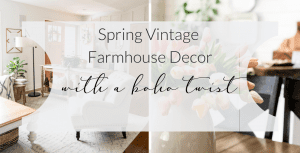 10 years I’ve wanted to hide these practical items and make our family room design pretty. And Kristy and Bill made it happen for me in just a few short weeks. Now that we had the two most important goals of my family room design accomplished, I was ready to make it extra cozy. Lots of throw pillows and blankets are my must-haves for coziness. I try to purchase pillows that are neutral enough to mix and match but offer lots of texture. This adds to their interest without overwhelming the space. And of course, a plush area rug is both pretty and practical. I loved this one from Well Woven because of its pattern to help mask stains. 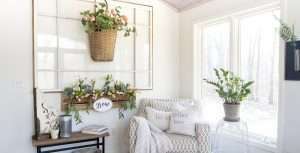 Plus, its neutral coloring is so helpful so that I can keep the same area rug if I choose to switch up my wall colors or larger furniture pieces. I also included a coffee table tray to help collect all 4 of our remotes. This has been so helpful so that we don’t spend 20 minutes each night searching the couches. 😉 Other than that, I added a few live (and a few faux) plants to bring some life to the space and called it good! 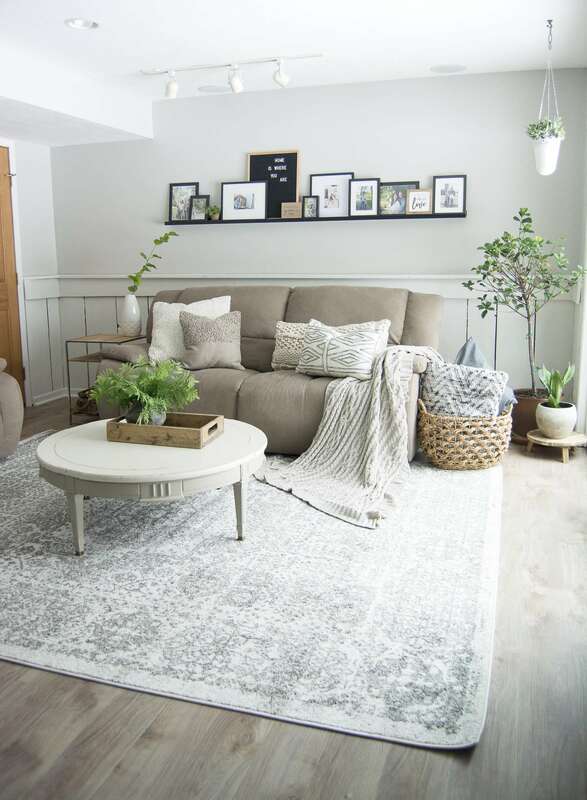 Using minimal, but impactful, decor in this space helps me check all the boxes of pretty and practical family room design. 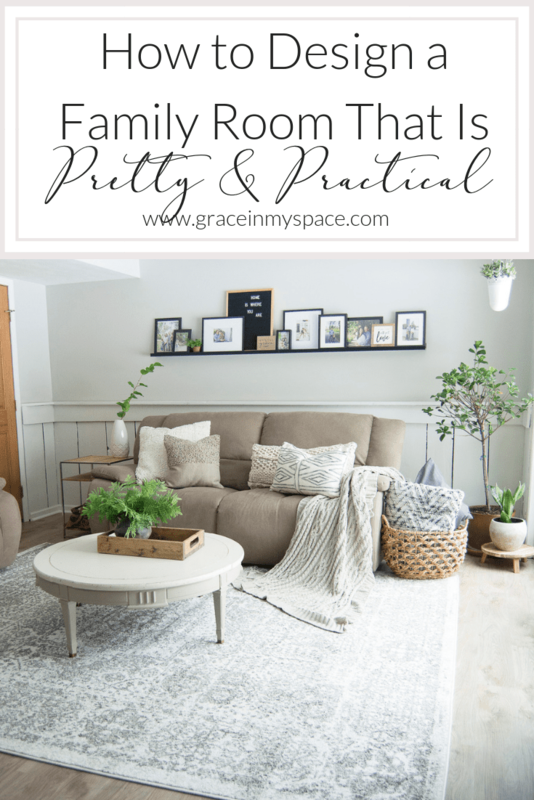 So let’s take a moment and break down some of the key elements of pretty and practical family room design. I often get asked things like, “How do you have so many light colors with kids?” “Do you actually leave your throw blankets displayed like this?” “Don’t your kids just break your decor?” I cover this topic in more depth in my book, Designing a Life: From House to Haven, but here is a quick breakdown of my method. Yes, I do drape my blankets all fancy-like. Yes, my kids do completely mess them up and throw them on the floor in a muddled mess. But we live here! I don’t have these blankets to look at. We use them and, yes, I fix them later to be all fancy-like just because I enjoy them that way. Sometimes my decor gets broken. But not as often as you might think! We’ve raised our kids in a decorated house. They know where they can be rough and where they can throw balls and play around. And they know how to be delicate with breakables. Because we’ve taught them how! It is simply a part of our family structure and how we are raising our kids. 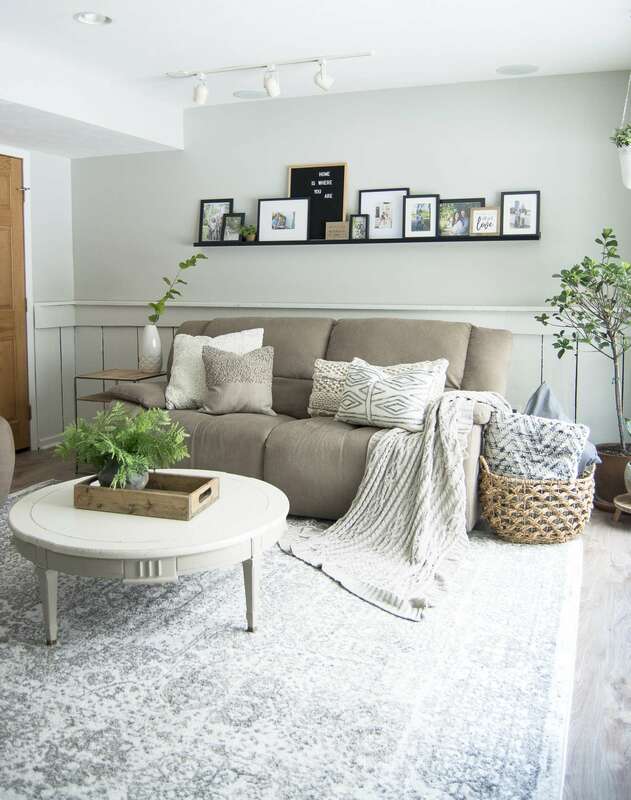 I hope that this has been helpful for those who may be looking for ways to make your family room design work for an active family! Do you have more tips that you’ve found successful? Leave me a comment below and share your knowledge!